Big Brother 2014 Predictions: Week 3 Eviction – Who Goes Home Tonight? Julie Chen is ready to count the votes on Big Brother 2014 tonight and the Big Brother 16 house is going to be losing some muscle tonight! Whether it is Caleb or Devin going home, the house will get a little weaker (and a little more sane) when either guy walks out the door! 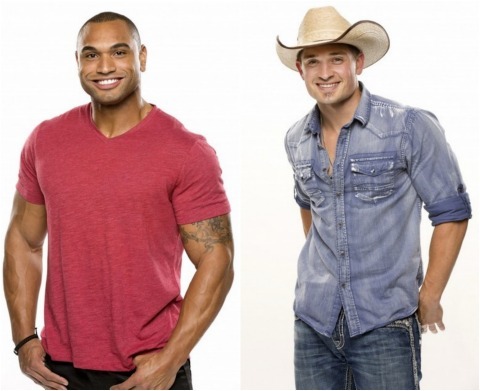 Who goes home tonight on Big Brother 16? Check out out thoughts below in our Big Brother 2014 predictions! Week 3 started with a plan in the Big Brother 2014 house and it was just a matter of having all the pieces fall into place. We saw Veto Night last night on Big Brother 2014 and there wasn’t a dry eye in the place when Donny showed us how much of a true gentleman that he is. While many people were out there crying when watching it all go down, we saw some major tears come from Jocasta after he saved her. We had some high hopes that the HGs would ban together and cause some kind of ruckus this week, but no such luck. Both Caleb and Devin need to go, but Devin is more pressing. Why? He is a loose cannon and has been a hot mess prior to this week. Don’t let his quiet manner this week deter from the fact that we all wanted him gone on Day 1! While he has mentioned his daughter 8 billion times this season, he will get the chance to see her tonight after the HGs vote him out! Devin Devin Devin….let’s get out Devin. No more hearing about his kid or the ants and his delusion of being an honorable player. And his creepy sitting alone in the house because he has no where to go and no one to talk to! I think it’s a lock that Devin will be taking the walk of shame. I’m curious to see what his goodbye messages will be. You think anyone will mention his daughter? You do know Devin has a daughter, right? Cat, he said he was letting his daughter down? HOW she don’t even know he is in there. He will be sent packing. I do not care for either of them if you ask me. They are both two meat heads with no heart like Donny. No idea. Was she born while he was in the house? If he had a daughter he most likely will be letting her down, he should cry about it. Hayden gave a shout out to America and live feeders this morning. He said we are the bees knees 🙂 . Someone should tell Christine that this is how it’s done. Calling live feeders creepy will lose her a few fans. Yes she did. Yet SHE was the one that signed up to be followed by a kazillion cameras. Go figure. I thought jeans were jeans. I was told it was ambers but I could be wrong. I loved it one of the first nights of Derricks reign in the HOH room when Devin came up and started talking about his daughter and Derrick cut him off and said hey we all have family out there I am missing mine too and Zack misses his brother and totally shut Devin up mid-sentence. I loved Derrick’s HoH blog from yesterday and he talks about doing it for his family, but then he doesn’t seem to mention it every two seconds in the house! Where can you read the HOH blog at? Go to Bigbigbrother dot com and scroll down about 4 posts to the one with Derrick’s picture on the stairs. Todd linked it to that post. Sweet thanks! I hope I remember to watch tonight! This article reminded me it’s on. I thought it was FRIDAY!? hehe! Thanks. I really do start to forget after a few weeks. I wonder who won last night. I’m getting as tired of Calebs “beast mode” saying as i am of hearing about Devins daughter. I’ve yet to see his beast mode come out. Donny has more of a beast mode than he does. At least Donny wins comps. Because he is a former NAVY SEAL! Don’t forget special forces, CIA and spy. HAHAHAH those HG are nothing but pure idiots. I’m surprised no one has decided he is one of the Duck Dynasty folks. After all, everyone with a beard must be related to them. hahahah now that is a good one Tessa and you are right. I do not care for them at all and do not watch that show anymore. Donny is just a pure old country boy. Yes there are men out there like him, I have one folks. He is as country as you can get. Agreed. And if I had a nickel for every time he said that worn out phrase “at the end of the day” yesterday … I could take you out for a fancy dinner!! That phrase drives me up the wall! It seems to be especially beloved by some of our delightful politicians. hahaha 🙂 so encouraging cat. It’s a no brainer. Devin has to go.